Since the BG (before Google) time we have been working with websites and search engines (yes they really did exist before Google) and getting websites ranked and doing better in search. Then came along this beast called Google and in no time at all everyone was using it, talking about it and they were on their way to take over the world. Well they run this little thing called Adwords which is an advertising platform which works on a Pay Per Click (PPC) basis, to ensure that their clients get the best from Adwords they have exams and a system called Google Partners. Well the system over the past few years has grown, evolved and become a bit of a beast when it comes to the success of a business. What has also become a bit of a beast is the way search works and the way that the users actually use the search engines. For example when Google was first created by Larry Page and Sergey Brin back on the 15th of September 1997 (yep almost 19 years ago) not many people had access to the internet over their mobile phone, a phone was for, well phoning people! Well all of this means that their Google Partners program is extremely in depth and you have to meet a fairly intense qualification criteria. Anyway, this week we are delighted to announce that our parent brand SiteGeek have officially become Google partners which means that our clients get all the benefits of the pay per click expertise, our SEO clients get the benefit of our Analytics expertise and our Social Media clients get the benefit of our YouTube skills! 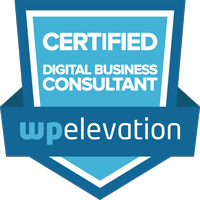 Don’t worry if you are a Design client either, we have the experts in WordPress with our WP Elevation certification along with the additional benefit of being Mobile Design experts as well. We don’t often blow our own trumpet but we have put a lot of effort into getting qualified and making sure that we have partnerships in place that allow us to give our clients the best possible solutions moving forward. What Does Being Google Partners Mean To You? To celebrate we just launched a new website with a whole load of new funky services that will help you ensure that your website is designed to convert, kept up to date and safe as well as promoted to get you found by people that are looking for your services. There is a stack more to come on our blog in the next few months as well, we have tutorials to help you promote and give you the best from your website, we have interviews with industry experts on how you can do more without breaking the bank and we have business advice that will help you with your overall conversions and promotions to get the most from your online efforts!